Description: This book provides a translation by Sir Muhammad Zafarullah Khan of the Riyad as-Salihin, literally "Gardens of the Rightous", written by the Syrian Shafi'i scholar Muhyi ad-din Abu Zakariyya' Yahya b. Sharaf an-Nawawi (1233-78), who was the author of a large number of legal and biographical work, including celebrated collection of forty well-known hadiths, the Kitab al-Arba'in (actually containing some forty three traditions. ), much commented upon in the Muslim countries and translated into several European languages. His Riyad as-Salihin is a concise collection of traditions, which has been printed on various occasions, e.g. at Mecca and Cairo, but never before translated into a western language. Hence the present translation by Muhammad Zafarullah Khan will make available to those unversed in Arabic one of the most typical and widely-known collection of this type. Author: Hadhrat Mirza Bashiruddin M. Ahmed (ra), 2nd Head of Ahmadiyya Muslim Community. Description: A popular edition of an excellent and affectionate account of life of the Prophet of Islam (pbuh) described as the most influential man in the history of the world. An orphan beckoned to the Call, persecuted by neighbours, driven from his home with a prize tag on his head, quickly establishing a strong community of believers ready to die for his teachings and finally returning triumphant only to forgive his tormentors. In this book, the author deals with an issue that has lamentably marked humankind's religious history. Relying on a wide range of interviews he conducted throughtout Pakistan, Antonio R. Gualtieri relates the tragic experience of members of the Ahmadiyya Muslim community. Their right to define themselves as Muslims has been denied by the Govt. of Pakistan acting in collusion with orthodox Islamic teachers. Ahmadis have been beaten and murdered. They have been jailed, hounded from jobs and schools, their mosques sealed or vandalized, for professing to be Muslims and following Islamic practices. This book records their testimony of Harassment and persecution resulting from their loyalty to their understanding of God and HIS revelation. Translation and short commentary by Maulana Ghulam Farid Sahib. The best quick reference Holy Quran with an extraordinary biblical in one volume. 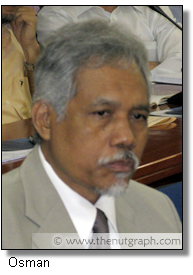 “WE have to live with those who do not accept Islam,” Emeritus Prof Datuk Dr Osman Bakar tells The Nut Graph in a phone interview. Osman, who is deputy chief executive officer of the International Institute of Advanced Islamic Studies (IAIS) Malaysia, says this applies to how Muslims treat Ahmadiyah as well. It is a timely question. The Ahmadiyah community in Selangor has been targeted over the past year by the Selangor Islamic authorities, led by Selangor’s religious exco Datuk Dr Hasan Ali. In fact, in April 2009, the Selangor Islamic Religious Council forbade Ahmadiyah in Selangor from worshipping in their own headquarters in Batu Caves on Fridays. In December 2008, the Selayang Municipal Council tried to make them remove the kalimah syahadat, or Islamic creed — “There is no God but God, and Muhammad is the messenger of God” — from their headquarters. The question of why the Islamic authorities are training their sights on Ahmadiyah is interesting, given that the 1975 fatwa explicitly declares them not Muslim. “If they are to be treated as non-Muslims, then we should not treat them differently from other non-Muslims in Malaysia,” says Osman. What seems to complicate matters is that Ahmadiyah not only preserve most of the prayer rituals that make them indistinguishable from Sunni Muslims in Malaysia. They are also mostly Malay Malaysians in this country. In other words, one cannot tell if a Malay Malaysian is an Ahmadiyah just by looking at him or her. Perhaps this is why the 1975 fatwa also asks for the state to strip Ahmadiyah of special Malay privileges. And that’s not the end of it — even though Ahmadiyah are considered non-Muslim according to the 1975 fatwa, Ahmadiyah children have to attend Islamic Studies classes in primary and secondary school. Their identity cards list “Islam” as their religion. 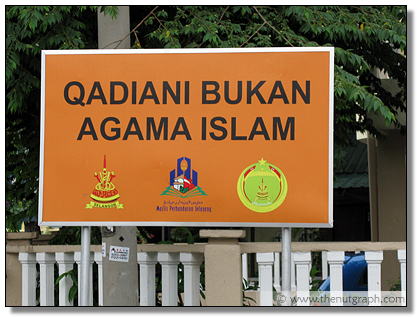 This, then, is the quandary that Ahmadiyah in Malaysia face. Osman says, however, that the formulators of the 1975 fatwa would have taken these complexities into account. “You see, there are two schools of thought in the Ahmadiyah movement. In the Indian subcontinent, they have distinguished between these two groups. The group that views the movement’s founder more as a saint, who urged spiritual renewal, is not considered to have fallen out of Islam,” says Osman. Even so, Ahmadiyah in Malaysia are but a tiny minority. They number only 2,000 at the most — that’s a mere 0.007% of a population of 28.3 million. Assuming roughly that Muslims form 60% of the Malaysian population, Ahmadiyah would only form 0.012% of all Muslims. That is, if they are considered Muslims at all. 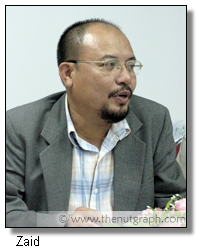 Zaid Kamaruddin, president of Muslim non-governmental organisation Jamaah Islah Malaysia (JIM), tells The Nut Graph that it is important to just see the humanity in everyone. “Somebody who was born into that sect only knows that as their religion, and we have to see this person as a human being. Only knowledge can alleviate matters,” he says in a telephone interview. “Nobody should take the law into their own hands,” he says. “We don’t want violence towards them the way it happens in Indonesia. “But as far as the fatwa goes, it is up to the Islamic council to decide. After all, those sitting on the religious councils are appointed by the sultans. It is not the purview of the state exco to implement the fatwa,” he says. In Pakistan in 1974, the constitution under Prime Minister Zulfikar Ali Bhutto’s administration was amended to effectively render Ahmadiyah as non-Muslims. After Zia-ul-Haq seized power from Bhutto in 1977, the persecution of Ahmadiyah intensified under his Islamisation project. In Indonesia in 2005, the Indonesian Ulama Council issued a fatwa calling for the government to ban Ahmadiyah. This opened a floodgate of violence against Ahmadiyah by Muslim groups which persists to this day. Thus, Ahmadiyah in Malaysia are afraid for their safety. However, they remain transparent and upfront about their beliefs and do not attempt to disguise or hide their headquarters. In fact, they say they have called for several public dialogues with the religious authorities, including the Selangor Islamic Affairs Department and religious exco Hassan. However, they say their requests have yet to be entertained. The Nut Graph’s attempts to reach Hasan also proved futile. But with or without private or public dialogue, the fate of the Ahmadiyah at the hands of the state doesn’t look all that promising. From being declared non-Muslims to being persecuted as “deviant” Muslims, it is obvious that the state is unlikely to provide protection for the rights of this minority group of believers.